Onit Interactive can analyze your business goals and create a customized social media marketing plan that can be easily administered. Social media is not just for social purposes anymore. It can build loyal followers that turn into customers and profit. Onit Interactive will analyze your business goals and create a customized social media marketing plan that can easily be administered. Whether you’re unsure of the landscape, or simply don’t have the time to maintain a robust social media presence – we can help. Your potential customers are already using the popular social media sites such as Facebook, Twitter, YouTube channels and blogs. The key is managing a mix of these to unify your message and better understand your customers and their needs. We listen, we write, we report. We’ll provide you with regular updates on traffic, followers, and what your customers are saying about your company and posted news. All this information works together with your traditional marketing efforts to help you create targeted, successful messaging. Onit Interactive offers a variety of social media management packages to help meet your company’s needs. We also offer the opportunity to build a customized social media plan and/or handle everything from our end. 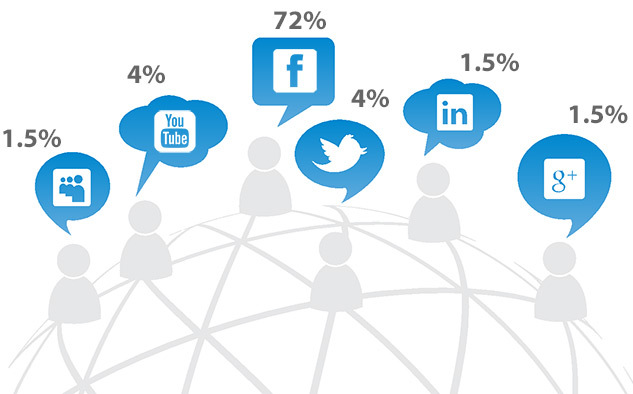 (below) Percentage of online population using social networking around the world. As a national footwear distributor of a few brands, we could not ask for a better partner than Dustin Lawson and the team at Onit Interactive. They not only meet all our demands quickly, but their insight to our business has helped improve the overall presentation of our products. We consider them a key part of our team!